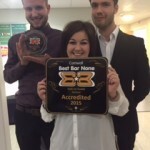 The fifth annual Cornwall Best Bar None Awards Evening was held at Heartlands, Pool on the evening of Tuesday 24 February when the premises achieving accreditation and winners were announced and we are very very happy to announce that we are one of those winners! The Best Bar None scheme is in place to promote good management practices and the operation of a licensed premises in terms of public safety, nuisance prevention, health and safety and the safety of children. Even though we were first-time entrants, we have achieved the incredibly demanding standard for the accreditation and we also won the category award for Best Small Pub! We managed to snap a couple of photos of the occasion with Paul, Ellie, Nick, George and Lauren. 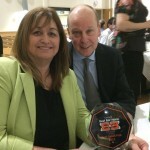 We’re incredibly honoured to have been given this award and we are, as always, dedicated to making our venue a place where our staff enjoy working and customers love to visit. 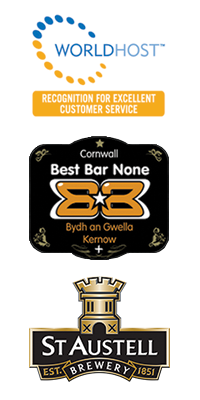 We’d like to take the time here to thank the team for their hard work which made this possible and we would like to thank everyone at Cornwall Best bar None for this prestigious award. 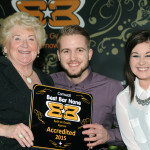 Please click the images below for larger pictures from the Best Bar None Awards.